If you like raw buckwheat honey, you should try our Raw American Bamboo Honey. American bamboo, Fallopia japonica, is a large, herbaceous perennial plant native to Eastern Asia, Japan, China and Korea. The hollow stems with distinct raised nodes give it the appearance of bamboo, though it is not related. American bamboo is of the family Polygonaceae, and is related to buckwheat; hence the honey is very similar however not as intense. 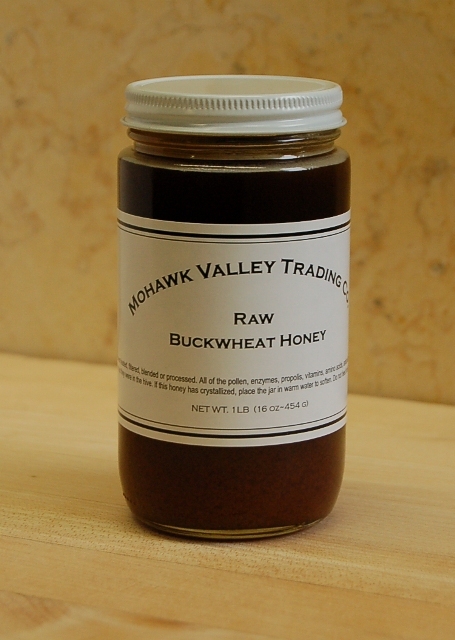 Raw buckwheat honey from The Mohawk Valley Trading Company has not been heated, filtered, blended or processed. All of the pollen, enzymes, propolis, vitamins, amino acids, antioxidants, minerals and aromatics are in the same condition as they were in the hive. No pesticides or herbicides are used in our apiaries and although we do not call it organic, our honey buckwheat honey is about as organic as you can get from The United States: Read more here Seattle Post-Intelligencer. From about July through thru October, we place hives in buckwheat fields on both slopes and the surrounding area of the Central Mohawk Valley and Finger Lakes region of New York. Raw buckwheat honey has a deep, dark brown color, strong, pungent, molasses like earthy flavor and is high in mineral content and antioxidant compounds. The benefits of buckwheat honey are many and well known; however, if you are planning to buy buckwheat honey for its health-benefits, it must be raw. Heating honey (pasteurization) destroys the all of the pollen, enzymes, propolis, vitamins, amino acids, antioxidants, minerals, and aromatics. Honey that has been heated and filtered is called liquid, regular or commercial honey. Although we specialize in raw buckwheat honey, we also offer regular buckwheat honey for those who prefer it. Buckwheat is neither a grass nor wheat, but is a fruit related to rhubarb and is one of the first crops cultivated in the United States. Dutch colonists brought buckwheat to North America where they planted it along the Hudson River. Buckwheat was sometimes called beechwheat, because its seeds look like small beech nuts. Buckwheat was an important crop in the U.S. until the demand declined in the 1960's. Today, it is primarily grown in Northern states such as New York, which is where our buckwheat apiaries are located. Buckwheat hulls are used as filling for pillows and zafu. The hulls are durable and do not conduct or reflect heat as much as synthetic fills and they are an excellent substitute to feathers for people with allergies. However, buckwheat hull pillows made with uncleaned and unprocessed hulls contain high levels of allergens that may trigger an asthma attack in those who are at risk.